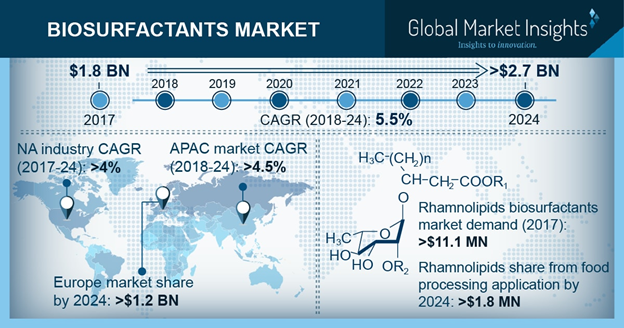 Biosurfactants Market size is set to surpass USD 2.7 billion by 2024; according to a new research report by Global Market Insights, Inc.
Increasing consumer consciousness towards usage of eco-friendly products in cosmetic & personal care industry may drive biosurfactants market demand. Growing usage of these products in anti-ageing creams and lotions owing to its anti-microbial properties may spur market demand. Supportive and flexible regulations pertaining to commercial scale production of biosurfactants will benefit industry participants in short as well as long- term. Biosurfactants are amphiphilic compounds which are produced in living spaces or excreted through extracellular hydrophobic moieties. It is used to stabilize aerated systems, control agglomeration of fat globules and improve shelf life and texture of starch containing products and fat-based products in food processing industries. Rising ecological concerns about the use of synthetic surfactants including low degradability, low toxicity is likely to be key aspects to drive biosurfactants market demand. APG (Alkyl polyglucosides) biosurfactants market size may surpass consumption at over 140 kilo tons by 2024. APG are widely used in hand dishwash detergents, hard surface cleaners, bathroom cleaners, bottle washing, grill cleaners and window cleaners owing to its water-soluble properties and are compatible with anionic, cationic and other non-ionic surfactants. APG from agricultural chemicals application may register gains close to 3.5% at the end of projected timeframe it act as agricultural adjuvant and contributes substantially to safer and most effective when applied to herbicides, which in turn foster biosurfactants industry growth. Sorbitan ester biosurfactants market demand may exceed USD 95 million by 2024. These are used as emulsifying agent for the preparation of ointments, creams, cosmetics and emulsions owing to their advance properties which include higher compatibility and enhanced stability with materials. These are extensively used in personal care application as they act as water-oil emulsifier for protective, baby care products and general-purpose soothing creams. These are used as wetting and dispersing agent for sunscreens and decorative cosmetics, thus stimulating biosurfactants demand. Sucrose ester market size was estimated at over USD 25 million in 2017. The product has multifunctional physical abilities which will help to increase in health concerns among calorie-conscious population. They possess the property of emulsification and act as a replacement of fats. Sucrose ester are broadly used in food processing application and may register growth at over 3.5% by 2024 due to its high-quality and effective food emulsifier and surfactant which caters to multiple functions including dispersion and emulsification averting retrogradation of starch and controls crystallization. These products are mainly used in sugar, fruit, food & vegetable preservation, thereby driving the biosurfactants demand. China biosurfactants market size may register significant growth at around 4.5% over the predicted timeframe. China and India have extensive existence of textile industries which may increase the usage of the product. Growth in the number of middle-class family, disposable income, and their constancy to purchase personal care and consumer products are also the major drivers to boost the regional product demand.